When it comes to contamination control in your facility’s operations, it’s important to maintain the immediate identification of contents in order to prevent cross- contamination. Not only does this streamline maintenance, but it eliminates the potential for multiple issues. ColorGuard™ adapters from Air Sentry efficiently identify a reservoir’s contents and keep them contained. The innovative, anodized color-coding system is available in eight distinct colors, and various models are available to suit your facility’s operations. Drum Adapter Kits allow fluid handling through one adapter while maintaining the storage container integrity. Air Sentry breathers can be installed on any storage tank or drum. Hydraulic Reservoir Adapter Kits allow breathers to be installed on any hydraulic fluid tank or reservoir. The aluminum adapters have quick connects in two sizes for pumping oil in and out, allowing the system to remain closed at all times. 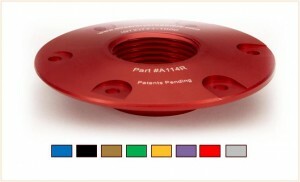 Domed Flange Adapter Kits provide a low-profile way to mount a 1” NPT dessicant breather to a hydraulic reservoir. Gearbox Adapter Kits (available in ½”, ¾”, and 1”) allow breathers to be installed on any gearbox, and oil can be pumped in or out without opening the gearbox to the atmosphere. They are a faster, simpler and cleaner way to handle gear oils and reduce ingression. Bayonet Adapters replaced a standard breather cap on a hydraulic reservoir. Simply remove the breather cap, place the adapter on the flange, and rotate. This entry was posted in Uncategorized on November 30, 2017 by 11688097.